Fashion Week Spring 2010, Here We Come! Ah–just as we’re starting to wear our first fall trends, it’s time to hit the Tents and focus on what’ll be hot–and not–for next spring. This will be our second season reporting on Mercedes Benz Fashion Week and we’ve got our get-gorgeous game faces on. This season, we’ll be covering over 80 shows and delivering daily backstage scoop with insider how-to tips, great visuals, and on-scene videos. We’ll be squeezing hairstylists, makeup artists, manicurists, stylists, designers–basically every cool trend setter we can get our mic in front of–on their best tips, favorite looks, and, of course, celebrity gossip. Next Tuesday, we’ll have some of the hottest hair and makeup trends to try on in our Makeover Studio! So no matter where you are, you can take part in the glitz and glamour of Fashion Week and road test the latest looks for yourself. Gearing up–and surviving–Fashion Week means a lot of late nights and fast-paced days…which makes looking glowy, well rested, and radiant a challenge. 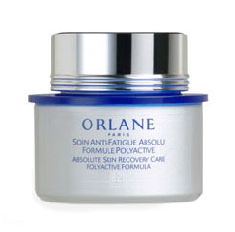 Here’s my savior: Orlane Paris Absolute Skin Recovery Care. It instantly makes dull, tired-looking skin look fresh and renewed and believe me, I’ll be slathering it on day and night in the days to come!